BRAOU PG Exams Time table, Hall tickets, Exam Fee due dates 2018/ BRAOU PG Exams Time table/Schedule, Exam Fee due dates notification 2018: Dr BR Ambedkar Open University(BRAOU) has announced its First/Second spell of annual examination schedule for first, second and third year post graduate courses(PG Courses), According to a release from the University, MBA third year examinations and the examinations for second year PG courses and MBA second year will be conducted from the following dates...and PG I Year Time-Table,Hall tickets, Exam Fee due dates 2018, PG II Year Time-Table, Hall tickets, Exam Fee due dates 2018, MBA I, II & III Year Time-Table, Hall tickets, Exam Fee due dates 2018 , BLISc, MLISc Time-Table,Hall tickets, Exam Fee due dates 2018, PG DIPLOMA-CERTIFICATE Programs Time-Table, Hall tickets, Exam Fee due dates 2018 are provide here..
1. డాక్టర్ బీఆర్ అంబేద్కర్ ఓపెన్ యూనివర్సిటీ పీజీ (స్పెల్-1) పరీక్షలను డిసెంబర్ 14 నుంచి నిర్వహించనున్నట్టు వర్సిటీ రిజిస్ట్రార్ తెలిపారు. పరీక్షల నిర్వహణ షెడ్యూల్‌ను విడుదలచేశారు. మధ్యాహ్నం 2 గంటల నుంచి 5 గంటల వరకు పరీక్షలు ఉంటాయి. 3. మొదటి సంవత్సరం కోర్సులకు 28 నుంచి ప్రారంభం అవుతాయని పేర్కొన్నారు. 4. ఎంబీఏ పరీక్షలు డిసెంబర్ 14 నుంచి ప్రారంభం అవుతాయని తెలిపారు. 5. కాగా, ఎంఎల్‌ఐఎస్సీ, బీఎల్‌ఐఎస్సీ, డిప్లొమా కోర్సులు, సర్టిఫికెట్ కోర్సులకు మొదటి స్పెల్ పరీక్షలను డిసెంబర్ 28 నుంచి నిర్వహిస్తున్నట్టు చెప్పారు. 6. పరీక్షల ఫీజు చెల్లింపు గడువును నవంబర్ 24 గా నిర్ణయించామని, ఫీజులను టీఎస్/ఏపీ ఆన్‌లైన్ కేంద్రాలు, డెబిట్ /క్రెడిట్‌కార్డుతో చెల్లించవచ్చన్నారు. Dr BR Ambedkar Open University (BRAOU) has announced first spell examination dates for post graduate courses. Examinations for first year MA – Economics, History, Political Science, Public Administration, Sociology, English, Telugu, Hindi, Urdu, M.Com and M.Sc-Mathematics, Physics, Chemistry, Botany, Zoology, Environmental Science, Psychology and Mass Communication & Public Relations will be held from 28-12-2018 to 03-01-2019. Similarly, second year PG examinations for the above programmes will commence from 21-12-2018 to 27-12-2018. Examinations for MBA third, second and first year students will be conducted from December 14, 21 and 28, 2018 respectively. The university will hold first spell examinations for students of Master of Library and Information Science (M.LISc), Bachelor of Library and Information Science (B.LISc ) from December 28 and exams for all Diploma and Certificate Programmes will start from December 14. The university advised students to visit the portal www.braouonline.in for spell-I registration. Last date for registration/ payment of fee through T.S / A.P.Online Centres is November 24. The students of II year MCPR and III year MBA appearing for Viva – Voce and the students of BLISc appearing for practicals (i.e.,P-7&8) should pay the prescribed examination fee along with other theory examination fee by way of single payment. Please take a print out after registration i.e., uploading the information through online and payment receipt for future reference. Please see the Note appended for details of examination fee. The PG Spell-II Examination Online Registration and payment of examination fee commences from 25-10-2018 and last date for Online Registration and payment of examination fee is 24-11-2018. For further details candidates may contact their study centre. Examination Schedule of P.G., I, & II Year, MBA, I, II & III Year , BLISc., and MLISc., Programmes – July/August, 2018. Please contact the Coordinator of your Study Centre for Project Report, Viva-Voce and Practical Examination Dates if any. a) The Examination Registration is only ONLINE No offline application is accepted. b) There is NO Re-Valuation for all P.G. and P.G. Diploma Programmes. Examination Fees as prescribed by the University. Director (SS), Dr. BRAOU, Hyderabad. e) The Examination Fee for each theory paper is 150/-. f) The Examination Fee for each theory & practical paper for BLISc is Rs.125/-. g) The students pursuing MBA Final year, have to pay an additional amount of 400/- towards Project/Dissertation fee. 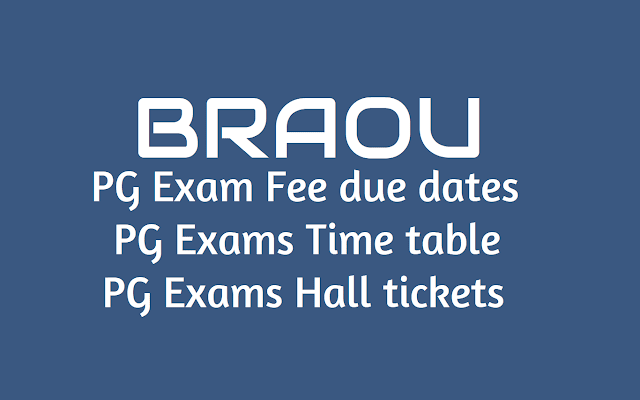 www.braouonline.in , two (02) days before the commencement of the examinations. *COURSE CODE No. M.B.A(01), Mathematics(02), Public Administration(03), Political Science(04), Economics(05), History(06), MLISc.,(07), Sociology(08), English(09), M.Com.,(10), BLISc. (17) Botany(22), Chemistry(23), Environmental Science(24), Physics(25), Zoology(26), Hindi(27), Telugu(28), Psychology(35), Urdu(37), and Mass Communication & Public Relations(80). For BLISc, MLISc, BPR, certificate programmes in Literacy and Community Development (CPLCD), Food and Nutrition (CPFN), NGOs Management (CNGO), Early Childhood Care and Education (CECE); PG Diploma in- Environmental Studies (PGDES), Human Rights (PGDHR), Women’s Studies (PGDWS), Writing for Mass Media in Telugu (PGDWMMT), Culture and Heritage Tourism (PGDCHT), Business Finance (PGDBF) and Marketing Management (PGDMM), the exams will be held from July 17. 1. Students need to select & apply required papers of i.e, PG(I & II Years),MBA(I,II & III Years),BLISc & MLISc in single application form including practical papers for BLISc & Viva Voce for MBA-III Year. No separate application form is accepted for individual years. a) Verify the papers applied correct or not. c) Verify Applied Papers, Exam Centre/ Study Centre, Medium before payment. d) Pay your exam fee at TS/APONLINE franchise centre or through Credit/Debit Cards after careful verification of exam application printout. b). Enter your Application Number (9 Digits number) and Mobile Number (10 Digits number). c). Re-apply all papers and verify all papers(I,II,III Year including practicals) are applied or not. Still your facing problem contact exam help line: 040-23680251 & 7382929 570/580/590/600.